One of the best ways to live a healthier and more eco-conscious life is to learn how to create your own laundry soap. Commercial laundry detergent is loaded with chemicals like petroleum distillates, sulfates, phenols, and fragrances, which are linked to cancer and lung disease. We all need to do laundry but opting for sulphate-free, cruelty-free, & plant based detergent brands are not always in the budget or even on our radar. 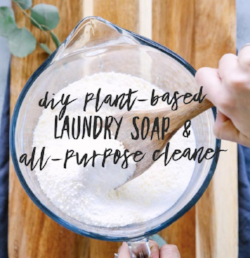 But what if you could learn a simple, effective, safe, and affordable method to always have the best plant-based laundry soap and all-purpose spray cleaner on hand? In this workshop, you’ll create the best all-purpose cleaner/degreaser you have ever used out of healthy, affordable, eco-conscious, and cruelty-free ingredients (some of which you are probably throwing in the trash on a daily basis). This spray cleaner works on counters, floors, tub/tile, glass, etc...It really is ALL-purpose. It will replace dozens of chemical laden cleaners and the plastic waste they produce. Leave with 16 ounces of ALL-purpose spray cleaner and a 2 pound batch of plant based laundry soap plus all additional ingredients necessary to complete your laundry soap the following day.